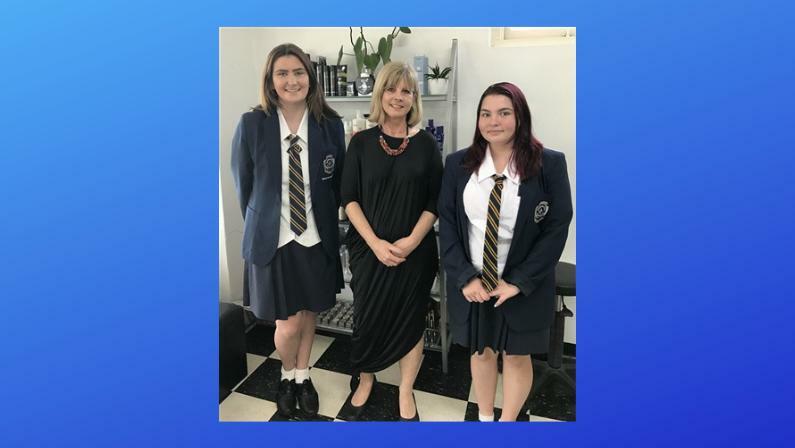 This afternoon I picked up Hayley Schafer (current scholarship recipient) and Haylee Smith from Everton Park State School who are both doing hairdressing studies via the schools program. I had pre-arranged with Debbie from The Style Company at Blackwood Street to speak with the girls and show them around her salon….to enhance and compliment their learnings of seeing different salons and how they operate. Debbie was very generous with her time and information with the girls. I could see the girls were genuinely engaged and interested in the conversation. Debbie has been in this industry for 23 years now! Debbie shared with the girls about stocking of products, dealing with suppliers, product support, time management, customer service, cashflow, systems and more. The girls and I had some great chats following this in the car on the return to school. I have since phoned Debbie to thank her for her generosity. Hayley Schafer, current scholarship recipient was also sharing with me that she has recently been offered full time work for 2018 at the salon where she is currently working. She is accepting this offer. I also note in the flyer from EPSHS at Big Breakfast that Hayley is the recent recipient of the Zonta Pine Rivers, Young Women in Public Affairs Award for 2017. Clearly a young lady with a bright future. Hayley is also interested in taking her hairdressing skills to assist those suffering from cancer. For my Health & Wellness pursuits of Kylies Courage, I collaborated with the owner of a salon who specialises in this field. I have put Hayley in touch with Amanda. Haylee Smith is currently putting together her application for a scholarship.